A blessing as it has cleared up the air and quenched most of the fires. The creek once again has a notable flow. EC is modelling 450 mm for Sarina area over the next 5 days. 330 mm for Mackay . 280mm for Airlie Beach and 290mm for Proserpine.Interesting forecast. 81mm at Paget since 9am this morning. 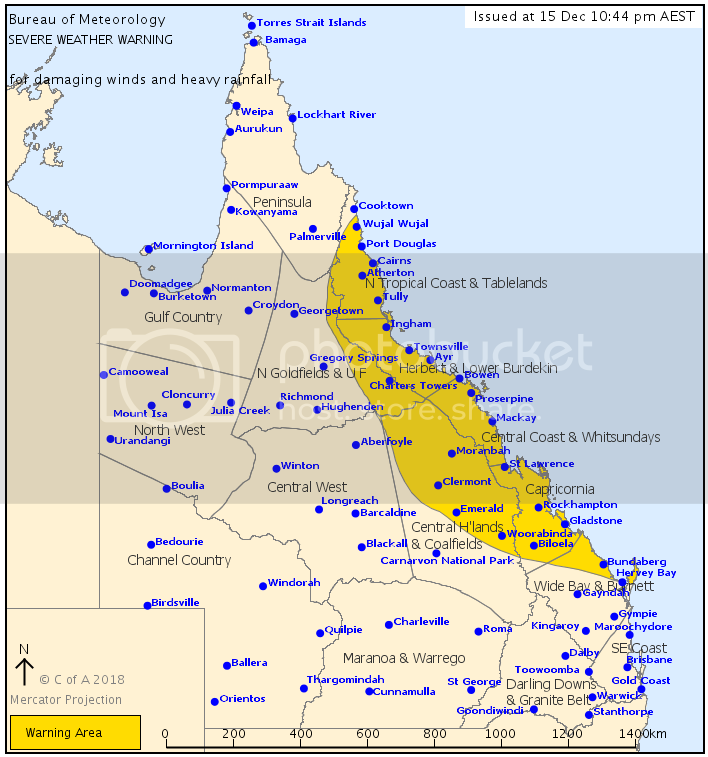 For people in North Tropical Coast and Tablelands, Herbert and Lower Burdekin, Central Coast and Whitsundays, Capricornia and parts of Northern Goldfields and Upper Flinders, Central Highlands and Coalfields and Wide Bay and Burnett Forecast Districts. Issued at 10:44 pm Saturday, 15 December 2018. Heavy rainfall to extend from the tropics further south through central Queensland on Sunday. Possible damaging winds in the northeast tropics. Ex tropical cyclone Owen currently lies over the east tropical inland. It is forecast to move southeastwards and will likely move off the Townsville coast through Sunday. A broad upper level trough will move east over the state on Sunday and will eventually shift offshore into the Coral Sea later on Monday. Heavy rainfall, which may lead to flash flooding, is expected to develop further over the eastern tropics south of Cairns overnight and extend south into central districts as the system tracks further southeast on Sunday. 6 hourly rainfall totals between 100-200mm are possible, with possibly higher totals with slow moving thunderstorms. Locations that may be affected include Tully, Cardwell, Ingham, Townsville, Palm Island, Charters Towers, Bowen, Proserpine, Mackay, Clermont, Emerald, Rockhampton, Gladstone, Biloela and Bundaberg. Currently the heaviest rain is occurring over the Herbert and Lower Burdekin district. Halifax east of Ingham recorded 122mm in the one hour to 10:00pm and 270mm in the 6 hours to 10:30pm. Damaging wind gusts in excess of 90km/h are possible over the North Tropical Coast district overnight and through Sunday morning, particularly near the base of the ranges. Locations that may be affected include Cairns. Severe weather is no longer occurring in the Peninsula and Gulf Country districts and the warning for these districts is CANCELLED. The next Severe Weather Warning will be issued by 5:00 am AEST Sunday. A land slip on Eungella range has closed the road FYI stay tuned for further updates!!! 6 registered (mithrandir, LonnyDave, Rhys., crikey, DarrylS, Nick Sykes), 70 Guests and 3 Spiders online.